1911 was a bumper year for exhibitions. In London there was the Festival of Empire and Imperial Exhibition at the Crystal Palace. In Turin there was the Esposizione Internazionale delle Industrie e del Lavoro. At the Hague in September there was the Drankweer tentoonstelling (Anti-alcohol exhibition) at the 13th International Congress against Alcoholism. There were many others. Far bigger than any of those mentioned, however, was the international hygiene exhibition in Dresden: the Internationale Hygiene-Ausstellung. The committee of honour at Dresden included the Berlin museum director Wilhem von Bode; Hermann Diels, who gathered the fragments of the pre-Socratic philosophers and tracked down the manuscripts of Galen and Hippocrates; and the most famous Greek scholar of the day, Ulrich von Wilamowitz-Moellendorf. The president of the historical section was Karl Sudhoff, Director of the Institute for the History of Medicine at Leipzig. 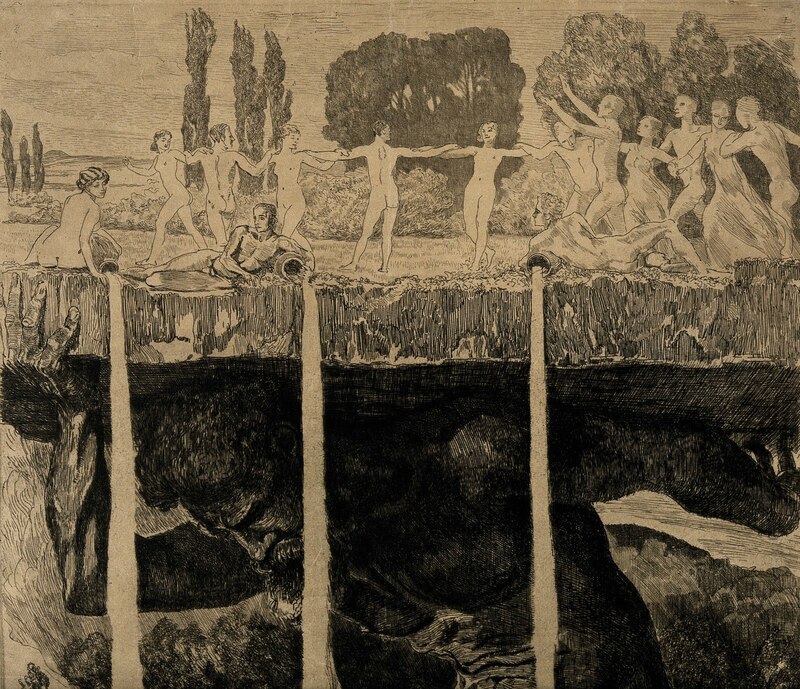 Also contributing to the exhibition was the artist Max Klinger (1857-1920). 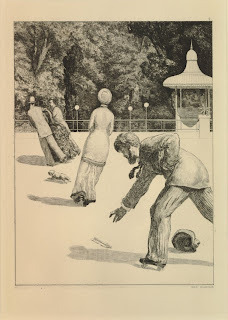 He will perhaps be known to many through his sequence of etchings The Glove (1879-1881), which might be described as a fetishistic psychodrama (image above from the British Museum). At the Dresden exhibition Klinger exhibited a larger-than-life-sized bronze sculpture of an athlete, and was commissioned to make a large etching on the theme of hygiene to present to VIPs who had helped with the exhibition. Here is Klinger’s etching (left: Wellcome Library no. 24236i), which he completed in 1912. How to interpret it? The giant can perhaps be seen as a symbol of the struggle for hygiene and sanitation. He has lifted a group of people up above the tumultuous world of nature: they dance and recline in an Italianate landscape, enjoying the delightful consequences of hygiene for all. The warring male figures below may symbolize the people and circumstances which work against hygiene. The three streams of water represent nature channelled into forms conducive to human life. There is also a racial distinction. The beneficiaries of hygiene, who have learned to master the forces of nature, and are raised up into the sunshine of life, are conspicuously white. 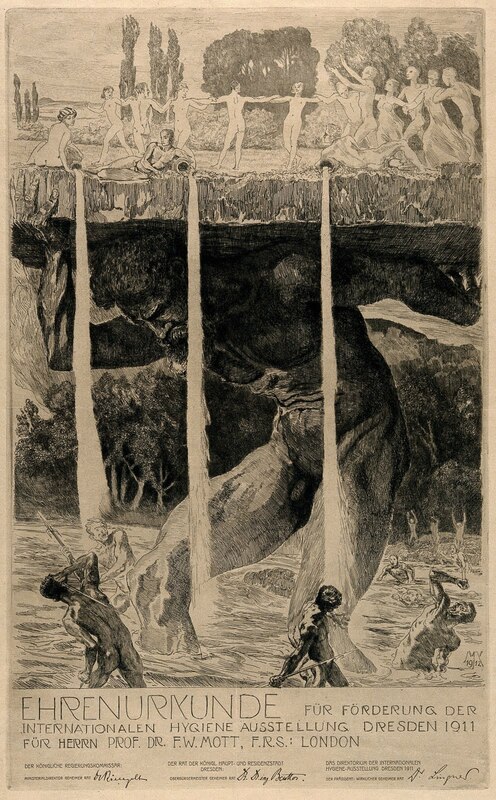 The savages in the river, who misguidedly attack the forces of hygiene, are prominently black. They are not dancing among the poplars, but rampaging with harpoons in an unruly river bordered by dark and threatening forests. Nor do they appreciate the three streams of pure clean water that flow from the Europeans’ water jars. 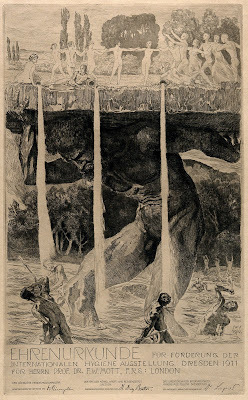 It is however remarkable that the Wellcome Library has two impressions of this large and apparently rare etching. One (left) was presented to Dr (later Sir) Frederick Walker Mott FRCP, FRS (1853-1926). 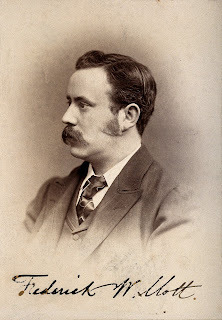 Mott (portrait right: Wellcome Library no. 15290i) was a neuropathologist, working both in asylums and in academia (at Birmingham University), who is said to have established the syphilitic origins of “general paralysis of the insane”. 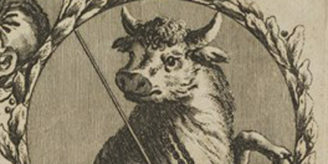 In Mott’s copy of Klinger’s etching, his name is inscribed at the bottom of the plate in the same colour ink as the etching itself, so that it appears to be part of the etching. The other impression (in the Wellcome Foundation archives in the Wellcome Library) was awarded to the “Wellcome Research Laboratories in London”, and the name of the recipient is handwritten in grey ink (the rest of the etching is in black). Presumably the Wellcome laboratories had lent items to the exhibition. 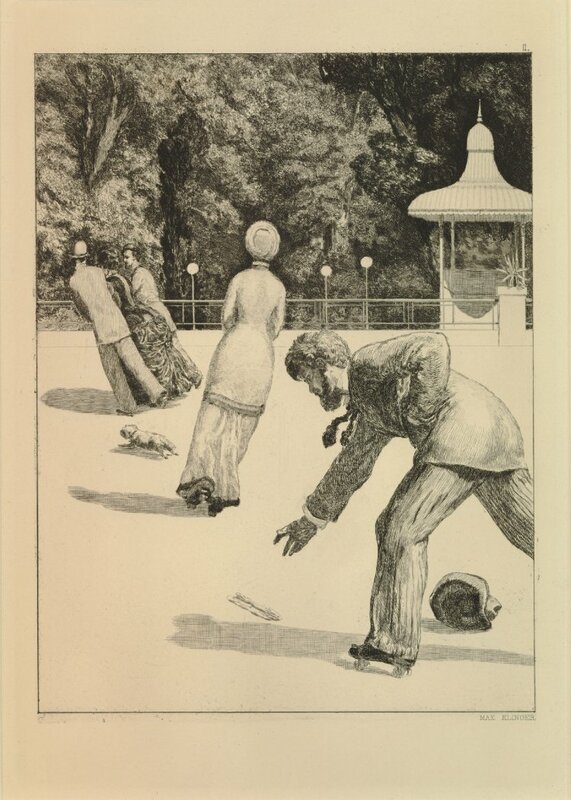 Klinger’s etchings up to 1909 were catalogued by Hans W. Singer, and those after 1909 by Carl Beyer, but Beyer’s work does not appear to have been published. It is a typescript of which a copy is in the library of the Kupferstichkabinett, Staatliche Museen zu Berlin. The hygiene allegory is no. 416 in Beyer’s catalogue, and the Wellcome impressions are of the fourth and final state of which 100 impressions were made. A century later, how many survive from the other ninety-eight? And to whom were they awarded? Historische Abteilung mit ethnographischer Unterabteilung. I. Historische Abteilung. 2. verb. und illustrierte Aufl., Dresden: Internationalen Hygiene-Ausstellung, . Wellcome Library catalogue record here. Fortpflanzung, Vererbung, Rassenhygiene: Katalog der Gruppe Rassenhygiene der Internationalen Hygiene-Ausstellung 1911 in Dresden. 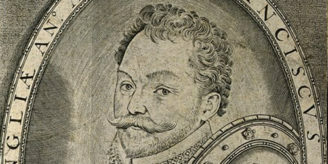 Herausgegeben von Max von Gruber und Ernst Rüdin; … Abbildungen von M. v. Gruber; nebst einem bibliographischen Anhang von Rudolf Allers, München: J. F. Lehmann, . Wellcome Library catalogue record here. Carl Beyer, Max Klingers graphisches Werk von 1909-1919: eine vorläufige Zusammenstellung im Anschluß an den Oeuvre-Katalog von Hans W. Singer. Many thanks to Dr Alexander Dückers for information about Beyer’s work.